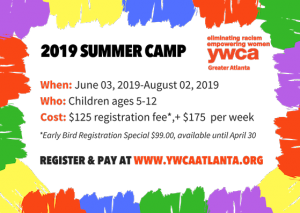 The YWCA of Greater Atlanta, Summer Camp is an eight-week summer program that provides hands-on activities and experiences that stimulate the campers cognitive, social, emotional and physical development for children ages 5 to 12 years old. Our campers engage in creative and educational enrichment activities, participate in a variety of arts & crafts projects, and enjoy field trips throughout Atlanta. Our campers start exploring at 7:00 am to 6:30 pm. We provide three nutritious meals: breakfast, lunch, and snack. Download the 2019 Summer Camp Application and pay the registration fee below. You can also visit the YWCA and pick up your application at the front desk. Send us an email at [email protected] with any questions you may have. Add the registration fee to your cart. If also paying the Weekly Fee, press “continue shopping” at the bottom of the page to return to the After School Program page and add the Weekly Fee to your cart. Repeat Step 2 for additional children. For an optimal web experience, please use a Chrome or Safari web browser.